An exciting day for our ChildFund Ambassadors and Camogie stars! This Saturday August 13th will be an exciting day for Camogie players and supporters as well as for ChildFund, as three of our own Ambassadors will be playing the Liberty Insurance All-Ireland Senior Championship Semi-Finals in Semple Stadium! Cork All-Star Aoife Murray and Wexford All-Star Mags D’Arcy will go “head-to-head” in the first of the semi-finals at 2pm, and All-Star Sarah Dervan’s Galway will face Kilkenny in the second semi-final of the day at 3.45pm. The Semi-Finals form part of a triple header with the All-Ireland Hurling Semi-Final Replay of Kilkenny v Waterford taking place at 6.45pm. The games will be broadcast live on RTÉ One. Aoife, Mags and Sarah, together with Fionnuala Carr from Down, have kindly agreed to get more involved in ChildFund’s work to help disadvantaged children and serve as ChildFund Ambassadors. 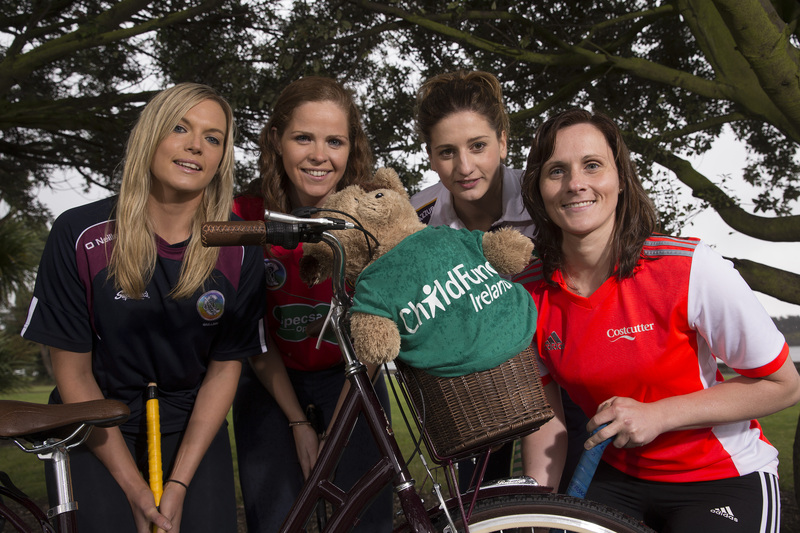 They have been promoting the partnership between ChildFund Ireland and the Camogie Association and its flagship initiative – the Dream Bike campaign. The Dream Bike initiative seeks to equip girls in countries where ChildFund operates in with the means to get to school safely and on time. This is something people may take for granted, but for children in developing countries countless obstacles can be placed in their way that ultimately interfere or derail their educational path. For a start, many children have to journey several miles a day just to get to school, sometimes anywhere up to ten miles on foot – a gruelling task for anybody, let alone a child. The journey is not safe either – along the way children can be exposed to a host of dangers from wild animals to child traffickers. So it can be a massive task for these children just to get to school regularly, not to mention to be on time. At home the biggest daily priority for many families in the developing world is sourcing fresh water. Sometimes children are forced to make long and backbreaking journeys to water wells or rivers to obtain drinking and washing water for the whole family. School becomes a secondary consideration and perhaps the idea of attending school regularly and obtaining a good education starts to feel like a mountain that is too high to climb. This is where ChildFund and our supporters come in! The idea behind the Dream Bike campaign is to provide girls in developing countries with a bicycle. To a girl who has to walk miles every day this can be massively liberating. It can literally help to put her own future in her own hands, giving her the means to get to school and far afield destinations more quickly and regularly, hopefully avoiding many of the potential dangers on the way. This is not just a gift for leisure or for sport; for these girls it can make a profound difference to their lives, both in the short term by giving them the opportunity to stabilise their education, and in the long term, helping to put them on a pathway to a more promising future with better options and prospects. A good education is their best route out of poverty and vulnerability; it is a chance for them to define their own lives and to determine what they might be able to do with their lives in the future. Aoife and Mags had the opportunity to witness first-hand the work that ChildFund does in developing countries and the satisfaction and joy of girls who received their Dream Bikes during a recent field trip to Ethiopia. 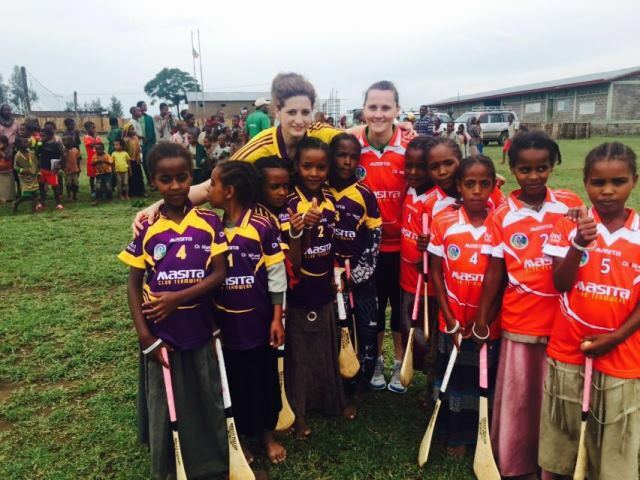 You can read what they said about this incredible experience here: Camogie Stars reflect on an unforgettable visit to Ethiopia: Dream Bike, and more info here: A great week for Dream Bike and Camogie in Ethiopia. ChildFund wishes good luck to all the Camogie players for Cork, Wexford, Galway and Kilkenny in the semi-finals this Saturday. Particularly, we are rooting for Aoife, Mags (but no goals please!) and Sarah – may the best teams on the day win! Your donation on €100 has the power to make a significant, immediate impact on the life of a disadvantaged girl – please donate now to the Dream Bike campaign here! You Are Here: ChildFund Ireland > Newstitle_li=newsfeed1 > An exciting day for our ChildFund Ambassadors and Camogie stars!